In this crazy world we can lose our way. Under the influences of the culture surrounding us we can become like the proverbial frog in the pot of boiling water; so unaware of what is actually happening that we don’t even comprehend the danger of our situation. Truth is being attacked at an increasing rate and it is crucial that we know what is True and what is counterfeit; where we are headed and why we are going there. To accomplish this, we must become diligent students of God and His Word. This is where we find Truth and direction. 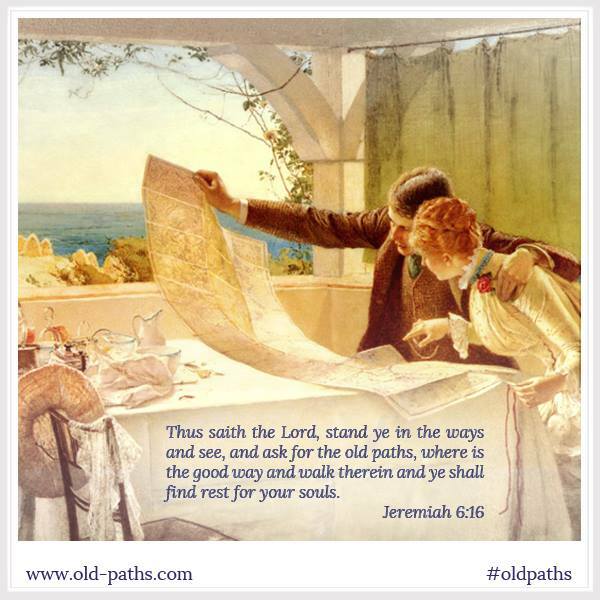 Thus saith the Lord, stand ye in the ways and see, and ask for the old paths, where is the good way and walk therein and ye shall find rest for your souls. Those words, and the lesson they contain, made a lasting impression that has stayed with me through my whole life. A few years ago it struck me how perfectly this verse was summed up into three parts: Seek, walk, rest. Without direction and purpose we will wander aimlessly, drifting hither and yon in whichever way the wind is currently blowing. We must seek His paths and find our course by studying the Guide Book we’ve been given. It is this that will navigate us safely through all the twists and turns of our journey. The old paths are not very popular and are likely to be overgrown and hard to find. To slice through the weeds, obstacles and confusion we need our Two-Edged Sword of the Spirit; to illuminate the way we need the Lamp to Our Feet and the Light to Our Path. “Ponder the path of thy feet, and let all thy ways be established.” (Proverbs 4:26) “Established” means “fixed”, “stable”, “secure”, “make firm”, to “be enduring”. Once God has shown us His path we must stand firmly on it as we walk steadfastly in it. This is where the rubber starts to hit the road, which as Christian discovered on the way to the Celestial City, can have rough, weary and lonely stretches. There will be trials and testing. There will be mountains. 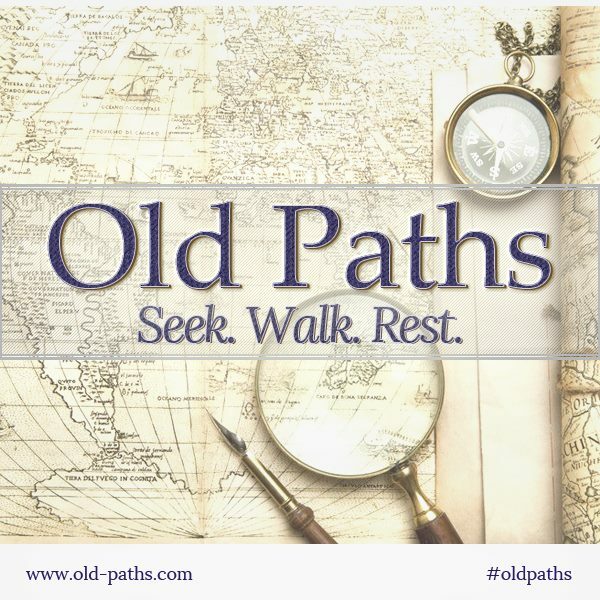 There will be times when the old paths lead straight through deep valleys; where the way seems so dark we can hardly put one foot in front of the other . Here is where we hold fast, press on and persevere to the end; with our Sword in one hand and our children led by the other. 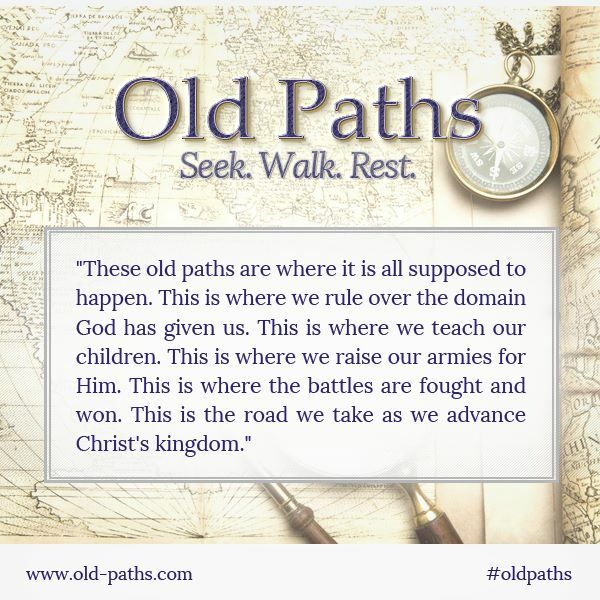 Here is another key point: the old paths are not to be strayed from. As we journey through life they are to be our dwelling place. This does not mean, however, that we stay in one spot; we are to steadily make forward progress always learning, growing and advancing. There is a powerful paradox here. We move forward as we look back. Not in the way the Israelites longed for Egypt and Lot’s wife mourned Sodom. A thing is not virtuous simply because it is old and once was. We do not look backward just to cling to what is familiar. Much is better left in the past. We must not be guided merely by antiquity, as if the plea of prescription and long usage were alone sufficient to justify our path. No; there is an old way which wicked men have trodden, (Job 22:15). But, when we ask for the old paths, it is only in order to find out the good way, the highway of the upright. 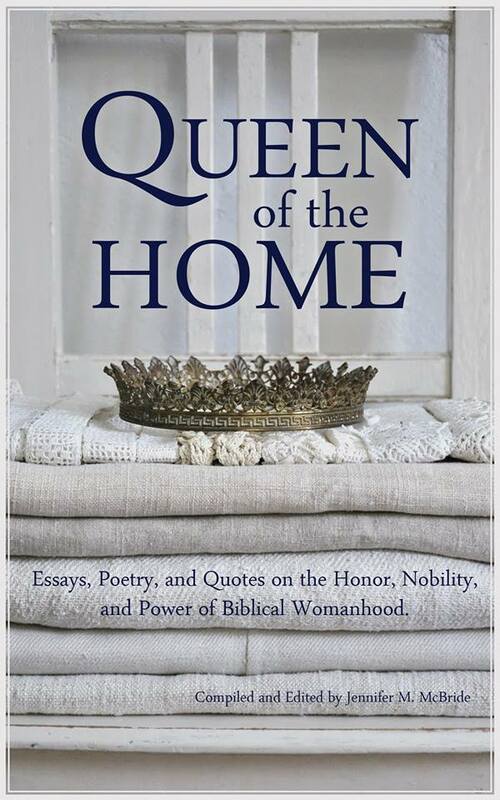 We look back instead at “Ebenezers” raised in remembrance of what God has done, and to obey as the Israelites did when the lost book of the law was found and hidden truth was rediscovered. Semper Reformanda – “Always reforming” – leads us to Truth, and Truth has always been. These old paths are where it is all supposed to happen. This is where we rule over the domain God has given us. This is where we teach our children. This is where we raise our armies for Him. This is where the battles are fought and won. This is the road we take as we advance Christ’s kingdom. 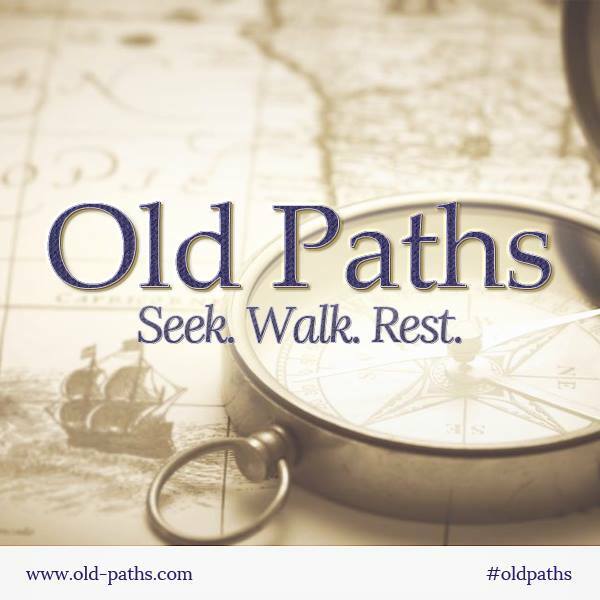 Seeking God and walking in His ways leads us to joy, blessing and rest. Wait a minute though (cue music screeching to a halt) …what about the times when we cry out to Him and He seems silent? What about when we are barely getting through the days, and they are exhausting and hard. What about when we feel like we are crawling along – pulling ourselves forward by our fingernails with the whole weight of our little worlds on our backs and there seems to be no relief in sight? What about when the the Enemy whispers in our ear that what we are dong is worthless and wasted and we find it hard to disagree? What about when everyone around us thinks we’re crazy – and they look so sane and rested? What about when we feel all alone on the journey? What about when we feel too tired to even want to be encouraged and reminded of why we are on this road in the first place? Aren’t all those ideals we hold to impossibly out of reach anyway? Where in the world is our rest and strength in Him then? If we could walk this road in our own strength we would not learn to depend on God the way we do when we fall exhausted and despairing at His feet – and when we learn to depend on Him, then we also glorify Him. Instead of patting ourselves on the back and feeling satisfied with our wonderful accomplishments we point to our faithful God and know the only reason we accomplish anything is because of His grace and mercy.